Funny Mama Ink. : Come on in! Ah blogging. It's been so long! This is not my first time around the blogging block, ya know. For a number of years I had a blog describing my exhausting journey with weight loss (or lack of weight loss I guess). Frankly I enjoyed the blogging more than I enjoyed the weight struggle. So now I'm going to blog sans the weighty issues. Ha.... As I've realized, life - she's a funny broad. You don't have to try hard to find the funnies in every day life. Especially when you're a mom. Oye, motherhood. Proof that God is a man.Childbirth is a cruel joke nobody gets. So ya.... I'm a mom. I love being a mom. I wanted to be a mom from the time I realized that was even possible. When I was a young lass, I would imagine stealing peoples' babies and taking care of them. Ya, maybe a little creepy but I don't think that way anymore. With two kids in my house, a 5 year girl and 5 month old boy, I've filled my quota... For now.... I remember after my son was born I shouted out: "I'm so glad I never have to do that again!" It's only been 5 month since the little man was pulled from my loins, but I'm already forgetting the mind-numbing pain.I could see myself having a third baby. My husband, however, doesn't have the same vision so that could be an issue down the line. When I'm not being mommy, mom, mama, mother, ma (à la Stewie Griffin), I write for a living. I freelance for a few different publications and I work part-time as an On-Air Promotions Producer which is a fancy way of saying I write commercials. I'm currently on mat leave, milking the government for all it's worth. Gosh, it feels good! Oh, I should also mention that I recently trained to be a birth doula. I'm kind of obsessed with all things childbirth. Don't know why. When I told my husband that I wanted to take the training he simply said: "but why?" He didn't understand why anyone would purposely choose to see that hot mess. Apparently our babies coming into the world had a lasting impression on him. So this blog is going to encompass a lot of things. It will be my place to brag about my adorable children (and they are). It will be a showcase of my projects in progress - from handmade cards to home decor projects. It should be embarrassing. But most importantly, it will be my sanctuary to spill my guts, bare my soul and share my life experiences with anyone who wants to indulge me. So the door is open! 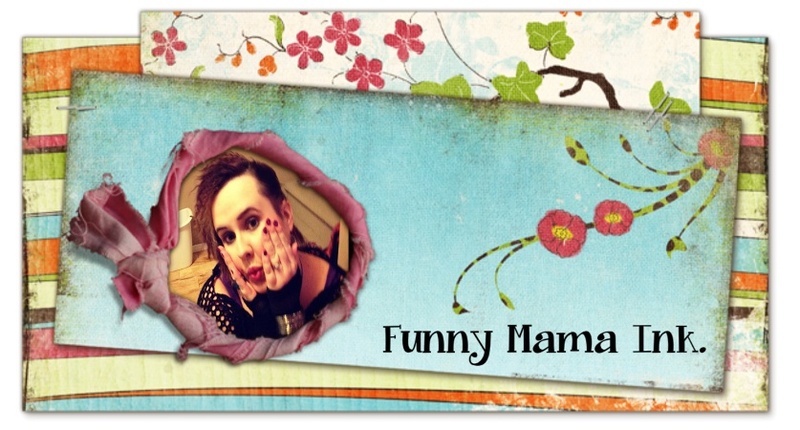 Welcome to Funny Mama Ink. Have a glass of crazy. It's on the house! love it Nat...you always make me laugh!